Tired of the usual steamed crabs? 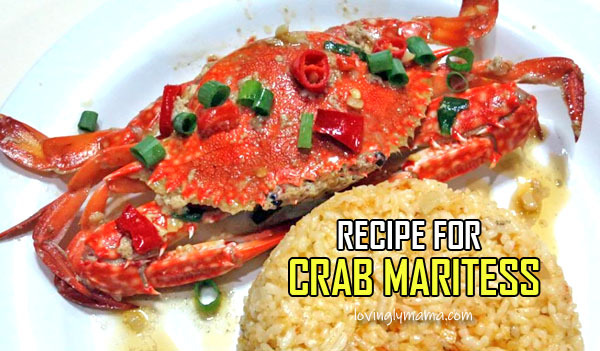 Try this simple but very tasty Crab Maritess recipe. I made it a bit spicy though, the way my husband likes it. This is a kitchen hack because I couldn’t find an authentic recipe online and I modified it according to my hubby’s taste. As usual, this is a modified Crab Maritess Recipe served with chicken oil garlic fried rice. But it’s easy and hits the spot. I might as well call this Crab a la Dennis. You know the saying, “the way to a man’s heart is through his stomach”? Well, that seems to be really true in our marriage. I think I can confidently say that’s how my husband fell in love with me in the first place. haha He was able to sample my homecooking during a church gathering and the rest became “our-story”. My husband is totally obsessed about seafood, most especially crabs, shrimps, and squid. He loves crabs so much that he would always think about it aloud. One night, we went to the wet market here in Bacolod City called “Pala-pala”. I was still heavy with child at that time and we live in a place where pregnant women are given special treatment. So I tried asking the vendor to give me all female crabs with orange aligue (crab fat). Without hesitation, she packed me the biggest and fattest female crabs from her pile. She gingerly checked each crab to make sure that each one had orange aligue. hehe I don’t think that I could always ask for that, as vendors don’t usually do that. We bought a kilo. An open, cooked female crab showing the orange aligue (crab fat). 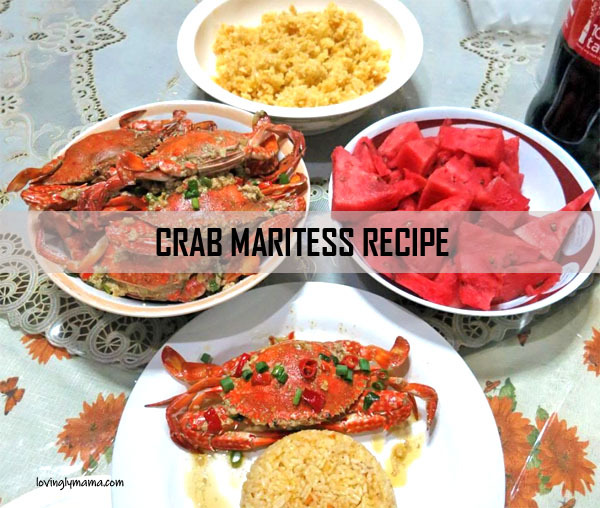 I wanted to prepare Crab Maritess but I couldn’t find an authentic Crab Maritess Recipe online so I thought of coming up with my own. I thought of making it mildly spicy because I know that hubby likes spicy food. So here is what I did. Or maybe I should just call it Crab a la Dennis, named after my husband, of course. hehe Hope you enjoy this simple seafood recipe. Heat oil and butter in a skillet and saute the garlic and chili for about a minute. Add the crabs, sprinkle with Maggi Magic Sarap and black pepper. Add the cheese spread on top. Swish the rice wine all over and try to mix. Cover and let cook for about five minutes. Turn the crabs on the other side and cook for another five minutes, moving the crabs around so that the sauce will not stick on the pan. Sprinkle the green onions and mix. Remove from heat. I opted to cook the crabs some more in the microwave to prevent the sauce from burning. This made sure that the crab meat was really cooked through. I cooked the crabs for another four minutes (four 1-minute settings) in the microwave. I didn’t just serve the Crab Maritess to my husband that way. Instead, I served it with chicken oil fried rice. I had some chicken oil drippings from the broiled chicken that I made the other day, so I used it to fry the rice. Spicy Crab Maritess with chicken oil garlic fried rice. Heat the chicken oil and saute the garlic and achuete powder. Add the rice and season with Maggi Magic Sarap. Mix well and let cook for a few minutes. Serve hot. So there goes our family dinner of Crab Maritess and garlic fried rice! It was a hot tonight that was made hotter with the spicy Crab Maritess recipe so the refrigerated watermelon slices were refreshing. Furthermore, we had ice-cold Coca-cola! aaaahhhh Nice. Note: Nice but not good for pregnant women. Additionally, not for the faint of heart. hehe Eat moderately. Our family dinner — not the usual for pregnant women. 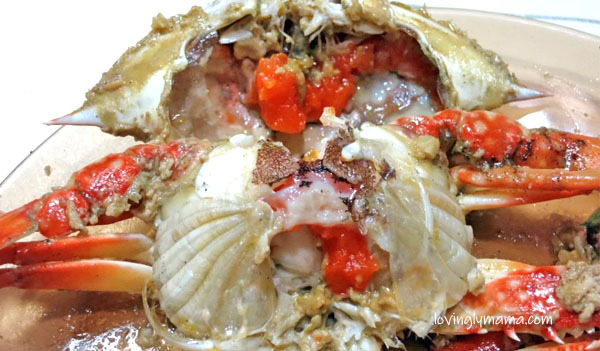 Enjoy this Crab Maritess Recipe. Lemme know your experience in the comments below. Previous Post Why Do We Send Our Daughters to Ballet School?